Click Here for the S.F. LiFE's Favorite Potluck Recipes! S.F. LIFE (Living Food Enthusiasts) is a non-profit group that began in 1987 as the San Francisco Living Foods Support Group. Our goals are to provide public education and member support for individuals and families who are pursuing the healthful benefits of the living foods, raw foods and fruitarian diets and lifestyles. The living foods lifestyle involves eating a diet of predominantly, or totally living and raw vegan foods, natural self-health care, physical fitness and spiritual development practices, and other ecologically beneficial activities. We network with other organizations who share mutual interests in vegan and vegetarian nutrition, health, spirituality and ecology. 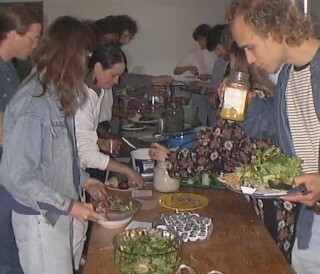 Each month, usually on the first Sunday, we hold open-to-public living foods pot luck events, the event includes lectures by educators in the field of living food nutrition and natural self-healthcare. The events are held in San Francisco, at 630 Valencia St. We provide our members with newsletters containing informative articles on nutrition, natural healing and lifestyles, plus living foods recipes, restaurant reviews, and a calendar of events. We also operate a health library, organize nature walks, and camping trips. Regularly updated event information can be obtained by calling our sproutline: 415-701-2855. · Discounts for potluck events. · Discounts for books and other items sold at events. · Free access to our book library. · Access to our equipment library at a nominal charge. Based on scientific evidence and our personal experiences, we believe that the most healthful diet for us is living or raw fruit and vegetables, and their seeds. Living foods are foods with their enzymes (the givers of their life force) in the activated state, such as ripe apples, fresh carrots and leaf vegetables, and sprouted seeds, nuts, beans and grains. Raw foods include all living foods plus those foods whose enzymes are in a dormant stage, such as dried seeds, nuts, beans, and grains, which when activated by water, can come to life and germinate and grow into sprouts. Living and raw foods all lose their life force, or potential life force, and substantial nutritional value when they begin to naturally decompose and when cooked with heat above 116 degrees F.
Studies have shown that the nutritional value of raw foods is far superior to cooked foods, and that the heat of cooking can alter the chemical composition of foods in ways which render them detrimental to our health. It has been well documented that many people worldwide have lived in superior health and attained extraordinary longevity on a raw foods diet as part of a lifestyle including vigorous exercise. A number of our members have lived in excellent health for years on a diet of nearly or all raw foods, and will testify that their sense of well-being is greater when they eat living and raw foods as compared to cooked foods. Potluck events are open to the public. However, members and non-members are requested to bring enough living (un-cooked), minimally processed, preferably organically grown food for at least ten(10) servings, and to bring their own eating utensils(bowl,/plate/mug, knife-fork-spoon). The potluck fee is FREE for members and $2 for non-members if you bring a potluck dish to share. If you do not bring a potluck dish to share, the additional cost is $8.00. You'll still need a bowl or serving utensil. Be sure to tag your serving pieces. If first participants are unable to bring food, a donation is asked to make it fair to other participants who have brought a pot luck dish. However, a pot luck dish is much preferred. Experiences has shown that $10 is a realistic minimum to prepare an adequate dish for a pot luck dinner. Combine with no other foods. Eat only on an empty stomach, and wait 30 minutes before eating other foods. Avoid mixing these foods. Combine only with non-starchy vegetables, except it is O.K. to combine avocado with any type of vegetable. OK to mix these foods and combine with any type of vegetable, except tomato. Bean and grain sprouts: Avoid mixing these foods. O.K. to combine with any type of vegetable, except tomato.